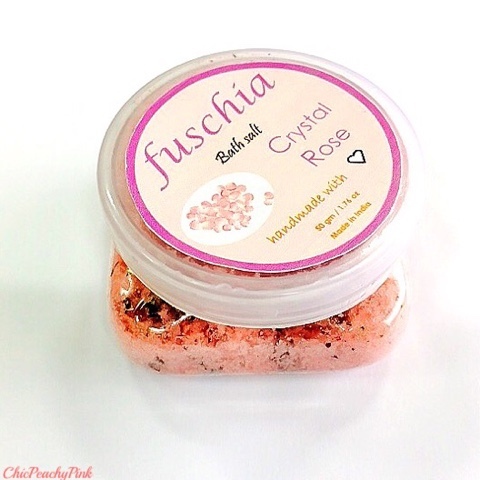 Claims: Fuschia Natural Handmade Bath Salts have been developed to mimic the properties of natural mineral baths or hot springs. The best way to refresh you after a long tiring day is to soak yourself in them. So simply allow the salts to swirl around gently as you take a deep breath, lie back and unwind in your own personal bath. Simply adding the bath salt to your bath water has several benefits. Contains mineral-rich sea salt to reduce fluid retention & promote circulation, Blended with Epsom salt that detoxifies by drawing impurities from skin. 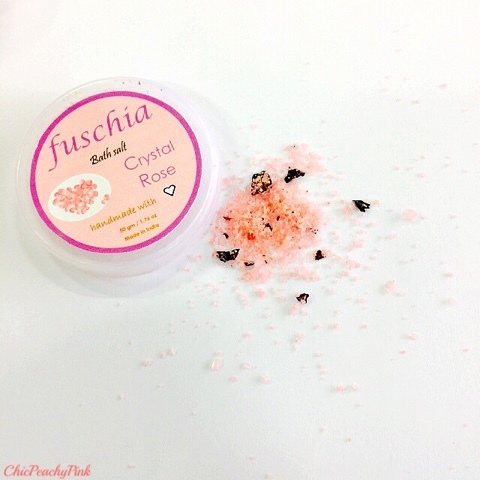 The Fuschia crystal rose bath salt is a natural and handmade bath salt. The product is housed in a see through plastic tub. Being a rose scented bath salt it has rose petals and mainly rose essential oil in it that gives it a pleasant and calming scent. The rose scent helps you relieve stress with the help of aromatherapy. As per the instructions you are supposed to use 50 grams of the product for one bath making this tub a one time use product. However, I find the scent a bit overpowering and that is why prefer to use only 20-25gm per bath. The product has an impressive list of ingredients that caught my eye and one of them being Epsom salt. It has been proved that a nice warm bath with epsom salt crystals can help you relax sore muscles and eliminates body aches. Along with Epsom salt there is also Himalayan salt, olive oil and dead sea minerals in it. Excluding the claim that it removes dead skin which I haven't noticed personally as I have not used it as a scrub, I find all its claims true. The best feature of them all is that this bath salt it is free of parabens and phthalates. Thumbs Up! Hope you liked this post. Also do let me know in the comments section below if have you tried any bath salts or which are your favourite bath salts? Nice review babe! I am yet to try their bath salts, have been reading about them since they were launched. I used sometimes bath salts in the past but after reading your post I know the salts I used were not as good as this one you introduce here. Thanks for sharing! I love the look of it. Can't wait to try. Great review , would love to try it out. Haven't heard of this brand, but wouldn't mind trying out the rose bath salts, I'm currently using one from Khadi. I've never used bath salts before, though I did just receive some from Kneipp. Hopefully I like 'em as much as you like these. I can already smell it from the photos! Thankyou Jeanne.. It surely is a great product! I love rose scented products, I don't like soaking myself in bathtubs but I'm tempted to try this out to relieve aching legs ! My Recent Post - Clinique Ginger Pop Cheek Pop Blush. i have tried this! amazing product na? It looks fantastic and i love rose scents. Can just imagine relaxing in the bath while some candles are burning with soft music in the background...girl i envy you! It looks and sounds great, thx for sharing. I love bath salts very much, especially with rose scents)) Great review! Such lovely pictures!!!! 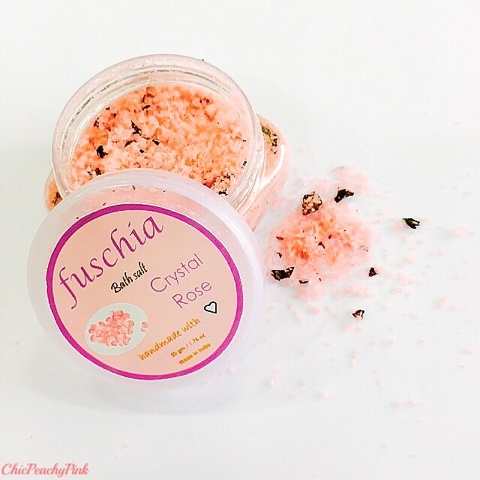 I love bath salts :) great review..
Im fond of these crystals. They give you feeling of Cleopetra! I love bath salts. I make rose bath salts with pink Himalayan salt, rose oil and rose petals! Great review, never tried bath salts though! !